November is a busy month for my library as it is parent/teacher conferences, book fair and Thanksgiving break. This being said, the MakerSpace has to get a little smaller this month as the normal 6 table space gets moved to about 1-2 since I need the tables for book fair. You would think this would be a good reason to just shut down the MakerSpace for a few weeks, but that would never do. Instead, I have found some activities that need less space, use few materials, but still promote the 4Cs and fun! 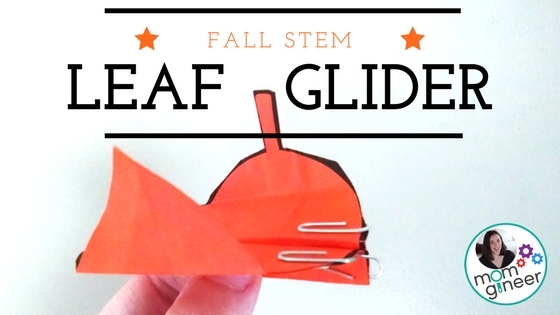 Leaf Gliders: Meredith Anderson has wonderful blog, Momgineer: STEM for the Classroom and Home, where you can find many great ideas for STEM challenges throughout the year. While many of her activities do link to resources on Teachers Pay Teachers, the general information you need to get the activity going is given on her blog and, if you wish, you can purchase the additional TpT resources for more rigor and extensions. I did purchase it for $2.50 and found the resources helpful. It was download, print and go! The great thing about this STEM activity it is encourages great problem solving skills with very few materials and is extremely easy to set up. All you need are some cut out leaves and paper clips. You can use the leaf patterns that you find anywhere or from the TpT kit. Students are challenged to manipulate the leaf by folding, rolling, and using paperclips to create a leaf glider (paper airplane out of the leaf). Students can experiment with which glider design works better, which leaf style works better, does adding more paper clips work better, etc. The possibilities are endless and as an added bonus, you can encourage students to measure the distance their gliders go. To find out more about this challenge and view some examples of gliders that students can make, be sure to visit the Momgineer blog! QuiverVision App: Last month my students had an absolute blast with the QuiverVision Jack O’Lantern 3D augmented reality sheet. There were so many “Ooohs and Ahhhs” as students watched their design come to life on the iPad. This month I plan to continue the excitement by provided some of the free QuiverVisions pages provided by Chick-fil-A. I have chosen 4 animal pages (dolphin, octopus, horse and butterfly) that students can see magically transform (using the free Quiver App) into 3D models that replicate what they have colored and then watch these models move and interact on the iPad. They are going to love it! Check out the many free packs compliments of Chick-fil-A here. Explore Item of the Month: Every month, I try to take out a MakerSpace item as a focus for the students to explore and create with. For November, I am taking out the Popsicle sticks, pipe cleaners and beads. These are inexpensive (often easy to get donated) craft supplies that provide hours of entertainment for all students. Here are some examples of creations my students have made in the past.